ThorntonWeather.com's new weather webcams provide a great way to view current conditions. We are pleased to announce the latest addition to our growing stable of features: Weather webcams! 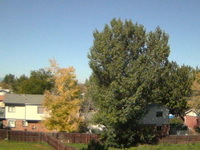 ThorntonWeather.com now features two live cameras that provide a great look into the current weather conditions in Thornton. The west camera provides a good view of the western sky to see what is approaching and happening right now. The east camera looks toward the plains and will show good “on the ground” conditions, particularly come winter when it starts snowing. This is an exciting new feature and we are sure it will quickly become one of our most popular! You can click here to view the webcam images right now! They are also accessible from our menus by going to Live Conditons and then selecting Weather Webcams. What do you think of our webcams? Are there other features, changes, or enhancements you would like to see ThorntonWeather.com incororate? Click the “Comment” link below and let us know! This entry was posted on Monday, September 15th, 2008 at 5:34am MDT and is filed under Site News, Thornton Weather. You can follow any responses to this entry through the RSS 2.0 feed. You can skip to the end and leave a response. Pinging is currently not allowed.